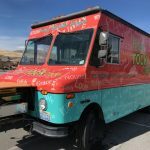 Find food trucks for sale across the state of Nevada. The majority of concession trailers and trucks on this page are located near Reno or Las Vegas. These are also the two main cities that food truck businesses operate within the state. If you’re interested in learning more about one of the units, contact information for the owner is published on each listing. Usually, you’ll find both the email address and phone number of the current owner. We always recommend scheduling an on-site visit to inspect any food truck you’re considering in person. This will ensure the unit meets or exceeds your expectations.